Shocking Arrow Lifts! is the first mission of Wet-Dry World in Super Mario 64 and Super Mario 64 DS. To reach the Power Star, the player has to raise the water level to about halfway using the Crystal Tap on the large, stone structure; accessible by using the Purple Switch on the bridge near the start of the level. Once the water level is raised, the player needs to swim north to the wooden floating platforms and use them to jump up onto the smaller platform above with the nearby arrow lifts. When the player stands on one of the arrow lifts, it will begin moving in the direction signified on the lift, then return to its original position. The player needs to use the moving arrow lifts to get to the platform on the other side while avoiding the Amp circling the lifts. Once on the other platform, jumping at the ! Block will produce the Power Star. It is also possible to complete this mission two other ways. With the water below the platforms, the player can Long Jump to the platform with the Power Star, skipping the arrow lifts entirely. With the water at its maximum height by hitting the Crystal Tap at the opposite end of the course, the player can jump out of the water below the ! 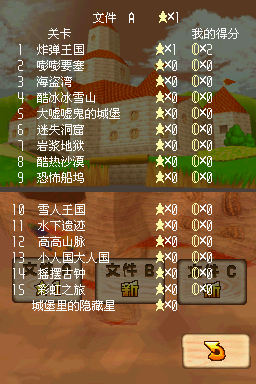 Block to destroy it, though this is not possible in the DS version. Biribiri no Mamerifuto Biribiri is an onomatopoeia for electric shocks, while 「豆」 mame means "bean" and indicated smallness, and rifuto is from the English "lift". Spanish ¡Mojando plataformas! Soaking platforms! French Mini plates-formes fléchées! Mini arrows platforms! Italian Sale o scende? Go up or down? Jjiritjjirit Ttangkong Ripeuteu Shocky Tiny Lift; 땅콩 ttangkong means "peanut" and indicated smallness. This page was last edited on April 10, 2019, at 16:23.